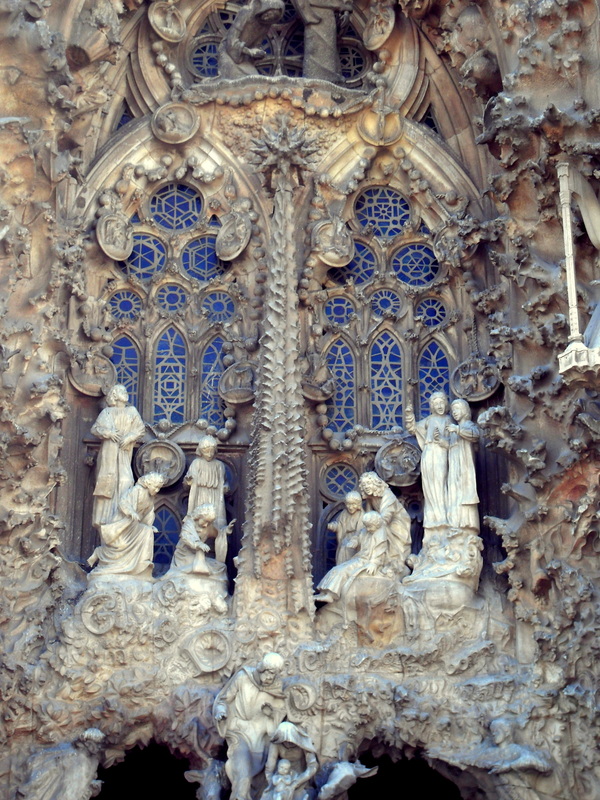 If you ever need a little inspiration on your spiritual walk through this life, then I’d recommend a trip to Barcelona to see Gaudi’s Sagrada Familia. Breath-taking. I went to a memorial service this weekend. It was a Catholic mass and a beautiful ceremony in honor of the life of someone who was, so clearly, a deeply religious and much loved man. I was honored to be there, to gather with others for this very important reason, and to revisit the ceremony of Mass—one I came to love during my time in Catholic school. I don’t think I got how meaningful rituals and rites of mass or other church services are to so many people before I started to practice yoga. Earlier in my life, and maybe a little now, I was really resistant to doing anything that lots of other people did. I think it was a way to reinforce an insecurity I had—the feeling of not being connected and not feeling included. I was also really resistant to any influence that came from the outside. If it was supposed to make me feel something, then I probably wouldn’t. All the years I spent going to church, it wasn’t really a spiritual experience or a way that I engaged in rites and rituals. Which is funny, because I really wanted it to be just that. Which isn’t actually that funny, now that I think of it. Maybe, I got in my own way or just wasn’t ready. Now that I have been practicing yoga, I’m much more engaged with the ceremony and the spiritual part of things when I go to church. I allow myself to notice how certain movements or body shapes can inspire that spiritual feeling. I can see that the ritual of putting our body into a shape (hands at the heart in prayer, kneeling, offering peace) day after day or week after week, can be a way of preparing ourselves to connecting to something bigger, something divine. Church has become meaningful to me in a way it just wasn’t before. Walking into a space that others believe to be sacred has meaning. Movement, song, chanting, rites—it all has the potential to get us ready to connect. I get that now. All these things that the congregants do in a Catholic mass are actually quite similar to the things I do in my yoga practice. We prepare to be able to focus body, mind and senses on something spiritual. There is even incense that gets spread around to bring our sense of smell to attention. All of these elements are a part of my yoga practice so I get it. It is meaningful to me. Except for the incense. Incense gives me a headache. How we use our voice– singing, chanting, speaking words in unison with other voices– this is something that happens in Mass and it happens in the other churches I have attended. It also happens in yoga. I have been chanting during my morning practice for a few months and it does something. It brings my attention to the words, meaning and sound and the way I hold my mouth and create the sound has a feeling that goes with it. I’m also pretty sure it does something to my brain that I’m not conscious of. Even so, I’m becoming aware of how sound is a really powerful way of connecting or creating a feeling if we tune in. And this is what really struck me at mass. After “peace be with you” and communion and prayer time, a woman stepped up to the apse to sing. She sang “Ave Maria.” I don’t really know what that song is about and it is in a language that I don’t speak, but I’m telling you, this woman opened her throat and sang the sounds of that song SOOOO beautifully that after that very first “aaaaaah-ve” the waterworks began. I felt something and it made me cry. Not a hyperventilating type of cry, just a pouring down of the tears. And I wasn’t the only one. All the women around me were weeping. Music moves me. It has for a long time. And when the music is made by someone’s voice, it resonates so deeply. When I first started practicing mantra in Sanskrit, it seemed so weird and foreign, but even though the formal practice differs from singing, the intention can overlap. Making certain kinds of sounds—open throat, gutteral, closing at the mouth, hard sounds at the back of the throat, these sounds communicate something to our feeling self. Mantra is a very sophisticated way of connecting to sound and how it resonates in our body. For the last couple of months, I have been chanting as a part of my meditation practice. The parts of my practice: asana, pranayama, chanting and meditation, are aspects of a practice that aren’t so different from the Catholic mass. They are there to prepare my mind and body to be able to tune into something deeper inside of me and around me. So when I sit there and begin to chant, and I open my throat to say, “oooooom” and then “Aaaaaaaaaaahpaya Swaaaaaa-haaaaaaaa”, it isn’t unlike the open throat sound of “Aaaaaaaaaavee Mareeeeeeeee-uuuuuuh.” It’s like this channel just opens right up from my mouth, deep into my belly, perhaps to my SOUL and what is outside is vibrating deep down inside of me or maybe it’s what is deep down inside of me starts vibrating out. Or maybe both. Maybe it is a way of connecting and opening to something that is so deep and meaningful that the tears can come. The longing for connection can be felt so profoundly that emotion is stirred. The open mouth and throat “Aaaaah” is a sound of relief. It is a sound of deep wailing. It is open from the mouth all the way down to the gut. Making that sound stirs feelings. So different than “ugh” that closes at the back of the throat, or “Shhhhh” or “blegh”. “Aaaaaah” and “ve” and “Maria” is open and relief and deep sorrow at the same time. I just never would have expected that becoming a devoted yogini would help me to appreciate the rituals of Christianity and all the meaning and devotion that other people express in their communities of faith. When I say it that way, it doesn’t seem like such a stretch, but I just couldn’t have anticipated it. And yet here it is. I Love that. is action, and you will be free. Many forms of sacrifice. Many paths to the infinite spirit. Action. Soak it up, baby. Seek it out and soak it up. It’s so good. Ave Maria in a tank. This went viral for a very good reason– giggles. < Previous Does your relationship help you to grow? Beautiful, Amanda. As for myself, I was never comfortable talking about God until I practiced yoga. When I set out on a spiritual path I began to see others on theirs. Maybe they’d been there all along, and now I see them for the first time and I think, Okay now I get it. Really fine post. Thank you. This feeling of seeing “it” for the first time is exactly the way I feel. And it makes me so excited and hopeful. If I’m only 36 and I am discovering these sorts of things now, just imagine what else there is to uncover and “see” in the next 60 years. Yes. This is wonderful. Thanks for your honesty. Nice! Hi to all you Ann Arbor lovelies. It’s amazing what we find when we stop looking so hard and drop our expectations for how things are supposed to be. Through yoga, with no expectations, you discovered something beautiful about a Catholic ceremony you experienced many times before, but not nearly in so meaningful a way. That’s awesome, but somehow also not surprising to me. Thanks for sharing so openly and honestly your journey. It is all about the journey, isn’t it?